This is a festive delicious meat recipe which is so popular in so many restaurants. 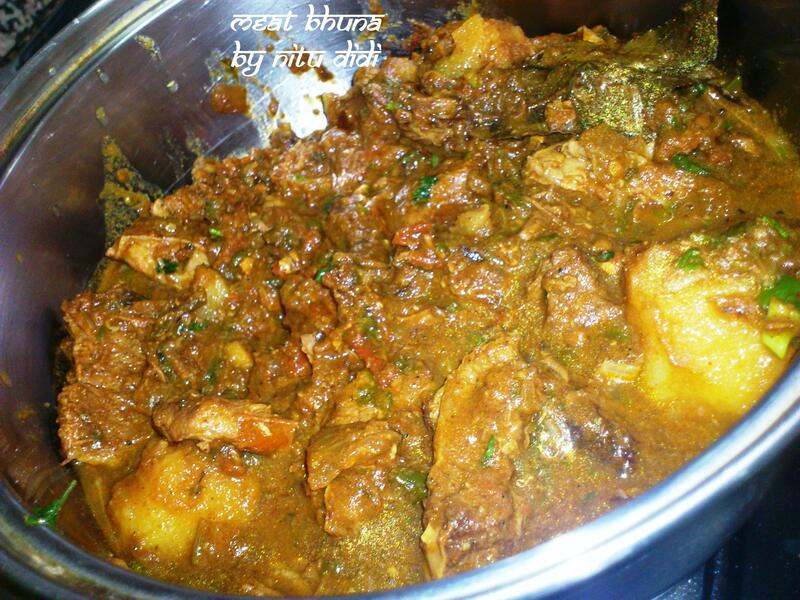 “Bhuna” means to slowly cook the meat till its tender and thats exactly what i did. The slow cooking ensures the meat gets done and gets this amazing flavour. One needs a lot of spices in this but you can always put less if you cant take so much of spice. Heat the oil /ghee in a thick pan and add the spices for the beginning (that is the bay leaf, 5 cloves and cinnamon) and let it sizzle for a few minutes. Then add half of the ginger and garlic and cook for a few seconds till the garlic and ginger starts to brown, taking care not to burn. Add the washed meat and let it cook till all the water that the meat oozes out evaporates and the meat starts browning. Add salt and the turmeric powder and the rest of the ginger garlic and then add the chopped onions and keep on cooking till the onions soften totally and the meat and onions are browned. Add the ground spices and the tomatoes and let the tomatoes cook. Add the chunky potatoes and the green chillies and the coriander leaves. Add a little water (just enough so the potatoes cook). If you dont want to add the potatoes please done. Cook till the meat cooks and is quite dry. PRESSURE COOKER RECIPE: the same above except use a pressure cooker and once you add the water just give it 2 whisltes. To make this richer you can add some dried chopped nuts in the end. I did not because my family doesnt like it. This entry was posted in Indian Restaurant Dishes, Lets eat Meat! !, Nitu´s Spicy Delights and tagged buna meat, spicy meat. Bookmark the permalink.